It's hard to believe that Sale-A-Bration is almost over for another year! I hope you've all had as much fun with it as I! The FREE (with $90 purchase) Springtime Foils paper is STUNNING! My last Sale-A-Bration package of freebies arrived while I was away on holiday, including this stunning Springtime Foils Specialty Designer Series Paper - so this is my first (and rather belated) play with it. All I can say is "Wow!" - it's sooo beautiful! .....but so hard to photograph! Sale-A-Bration ends at midnight on 31st March, so if you live in Australia, visit my online store - you'll be able to choose a FREE, exlusive Sale-A-Bration item for every $90 of product purchased. I used my Pool Party Stampin' Blends (alcohol markers) to colour the background of a piece of the paper that features copper foil flowers with gold highlights. 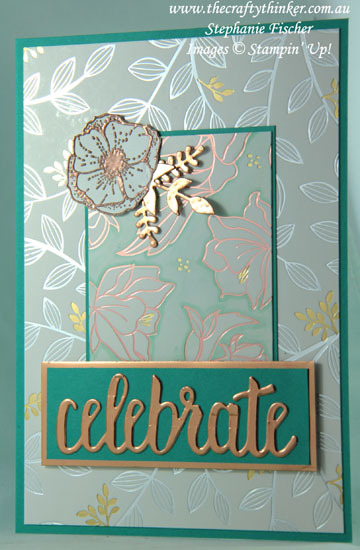 I then used another of my Sale-A-Bration freebies, the Amazing You stamp set, to copper heat emboss the gorgeous flower that I cut out and stuck on a corner. 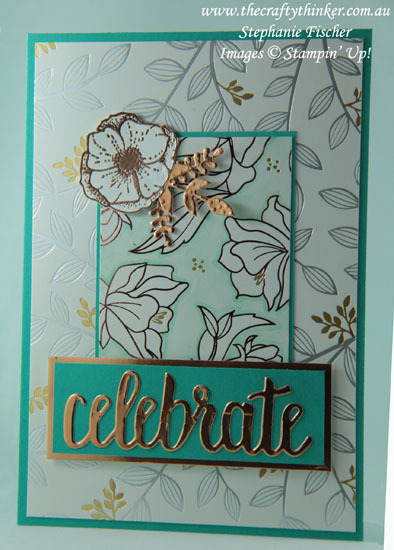 Another Sale-A-Bration freebie was perfect for cutting out a copper foil greeting. The word "Celebrate" is one of the dies in the Celebrate You Thinlits set. The Multipurpose Adhesive Strip that I had applied to the back of the foil made it very easy to stick to the strip of Bermuda Bay card with it's copper foil edge. I used the Bouquet Bunch Framelits dies to cut the foliage from some Copper Foil Sheet. A card that celebrates Sale-A-Bration 2018! After colouring the paper with my alcohol markers, I cut it in half and used the other half on another card, which I've included below - although, once again, I couldn't capture the true warmth and beauty of the paper in my photo. I used Pool Party card for the basic card this time. 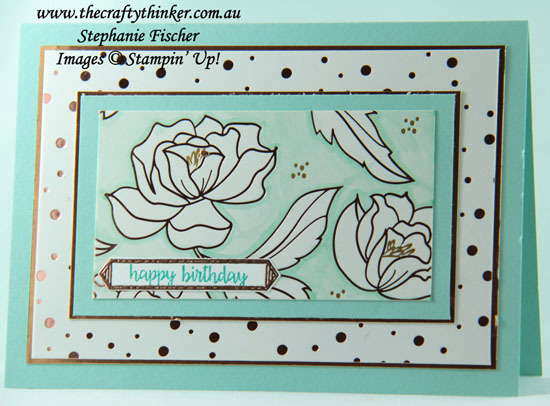 The sentiment and label outline are from the Happy Birthday Gorgeous stamp set. The sentiment is stamped with Bermuda Bay ink and the label is copper heat embossed and then cut with the Classic Label punch. Springtime Foils paper is so gorgeous, very little else is needed!